Juventus manager Massimiliano Allegri felt teenage forward Moise Kean should not have responded to racist chants from the home stands with his goal celebration at Cagliari - but called for the "idiots" responsible to be handed lifetime bans. 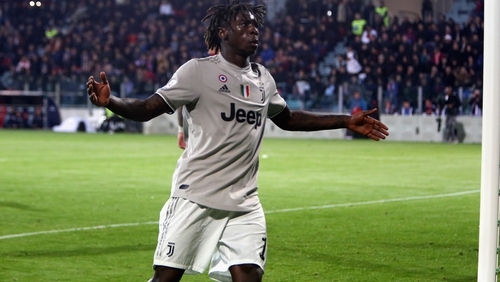 Kean, though, had the final say when scoring Juve's second goal of the 2-0 win with five minutes left before standing next to the post, his arms spread in defiant response to the abuse coming from the stands behind - which only continued to grow louder. Juve's France midfielder Blaise Matuidi appeared to gesture to manager Allegri he should take his players off. There was a delay of around some three minutes. An announcement had been made over the public address system to highlight the issue - which was greeted by more jeers from some home supporters. "The best way to respond to racism #notoracism". Earlier on Tuesday, UEFA president Aleksander Ceferin insisted referees would be told to be "brave" and halt matches to stamp out such abuse from "loud, aggressive and primitive" people. Kean, whose goal added to Leonardo Bonucci's towering header in the 22nd minute, was handed a start by Allegri at the Sardegna Arena. "He shouldn't have celebrated in that manner," Allegri said afterwards in a press conference reported by the club. "He is a young man and he has to learn, but certain things from the crowd also shouldn't be heard." In his post-match comments to broadcaster Sky Sport Italia, Allegri turned his attention to the need for the football authorities to tackle the "idiots" head on. "You need great intelligence to deal with these situations and should not go to provoke people. That, of course, does not mean the idiots in the crowd and the way they reacted should be justified," the Juventus boss said. "As always in life, there are idiots who do stupid things and ruin it for everyone else. "I don't think talking about it all the time helps. I don't think halting play helps, because not everyone in the stadium did that. "We need to use the cameras, find those who are doing it and punish them. It's very simple, identify them and not one-year ban or two, just give them a lifetime ban. "We've got the technology, it can be done if the authorities want to. The problem is, they don't really want to." "Kean knows that when he scores a goal, he has to focus on celebrating with his teammates. He knows he could've done something differently too," Bonucci told Sky Sport Italia. "There were racist jeers after the goal, Blaise heard it and was angered. I think the blame is 50-50, because Moise shouldn't have done that and the Curva (Cagliari's 'ultra' fans) should not have reacted that way.